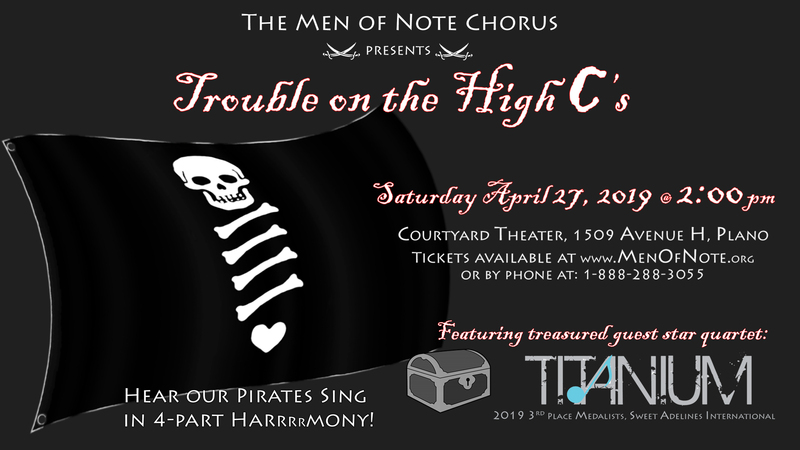 The Men of Note, Plano’s premier men’s A Cappella ensemble, announces its Spring concert, Trouble on the High C's, on Saturday April 27, 2019 at 2:00 PM at the Plano Courtyard Theater (1509 H Ave, Plano, TX 75074). Under the direction of Natalie Berdahl, The Men of Note will present a musical pirate-y adventure that is sure to delight and entertain audience members of all ages. 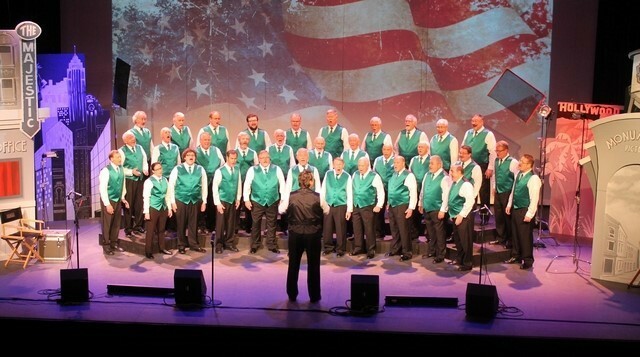 This family-friendly event will showcase songs by the Men of Note chorus as well as quartets including the 2019 3rd place Sweet Adelines international quartet TITANIUM. Are you ready to really impress your loved one this Valentines Day? 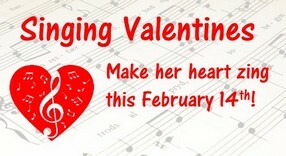 The Men of Note will be delivering Singing Valentines all day on February 14 and this is your opportunity to make this year special! A formally-dressed quartet will sing, in-person, two love songs in four-part a cappella harmony. We will also present a rose, stuffed bear, or balloon (your choice), and a card with your personal message inscribed. Prices start at $60 and there are extra charges for smaller delivery windows. We'll travel to the venue you choose within the North Dallas or Collin County area. The Men of Note, Plano’s premier men’s A Cappella ensemble, announces its Holiday concert, Deck the Halls, on Saturday December 1, 2018 at 2:00 PM at the Plano Courtyard Theater (1509 H Ave, Plano, TX 75074). Tickets are $15 for general admission seating and are available from any Men of Note member or at this website. 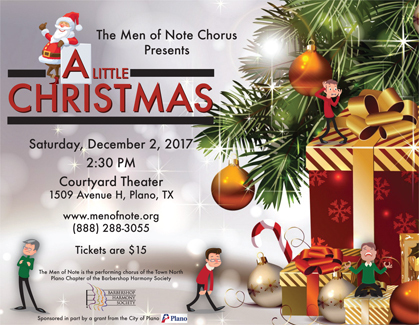 The Men of Note, Plano’s premier men’s A Cappella ensemble, announces its Holiday concert, A Little Christmas, on Saturday December 2, 2017 at 2:30 PM at the Plano Courtyard Theater (1509 H Ave, Plano, TX 75074). Under the direction of Terry Chapman, The Men of Note will sing favorite Christmas classics along with popular holiday music structured around a narrative that helps to discover the true meaning of Christmas. This family-friendly event will showcase songs by the Men of Note chorus as well as various quartets and ensembles. It is a great way to start the holiday season with a program that has a great message along with favorite Christmas classics and popular holiday music. Tickets are $15 for general admission seating and are available from any Men of Note member or online. Come join us at 7:00 PM on Saturday, October 7 2017 at the First United Methodist Church Richardson (503 North Central Expressway, Richardson, TX 75080) for some great a cappella music. The concert will be presented by the Men of Note, an a cappella men's chorus providing entertainment, education and service to the Collin County/North Dallas region of Texas. The Men of Note opened the Plano City Council meeting on December 12 with the Pledge of Allegiance and a couple of songs to spread the holiday spirit, as we have for several years. 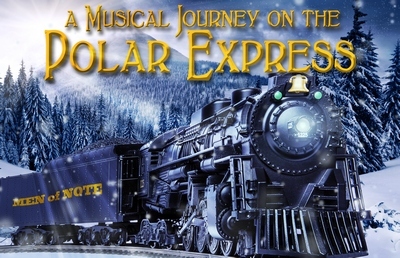 Take a musical journey on The Polar Express with the Men of Note, as this popular A Capella men’s chorus presents two performances of their annual Christmas show 8pm-Friday evening December 2nd and 2pm-Saturday afternoon December 3rd, at the Courtyard Theater in historic downtown Plano. The Theater is located at 1509 H Ave, Plano, TX 75074. The award winning Men of Note chorus will feature favorite Christmas classics along with popular holiday music, all in brilliant 4-part harmony… great for the whole family. Starting this year, reserved seating is available at Men of Note Tickets. Guest performances on the show include OneSound… an A Cappella pop vocal group of nine vocal performance majors from Collin College, singing in the style of Pentatonix and other contemporary stars. We’ll also present The MadriGals… a women’s group from the popular Sweet Adelines International. Dressed in period costumes and performing in the Renaissance and early Baroque styles, the Madrigals put a lively contemporary twist on holiday favorites. The Plano Men of Note announce their 2016-2017 season of great a cappella music and entertainment. The Men of Note will be performing for the first Plano Arts Festival on September 17, 2016. 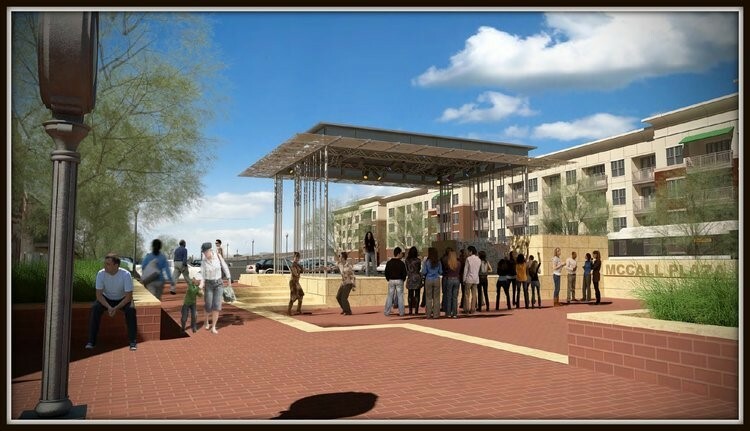 Come hear us sing at 11:00 AM at the McCall Plaza stage right in the middle of the Downtown Plano Arts District. There will be booths, food trucks and other activities as part of this event as well. So come out and have a great time and listen to some great a cappella music! 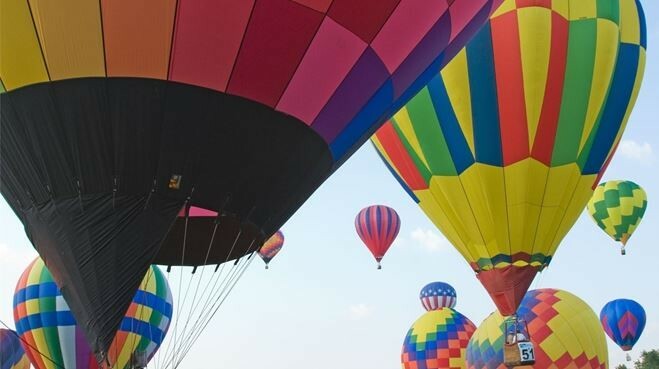 The Men of Note are back again this year for a performance at the Plano Balloon Festival at 5:30 PM on September 25, 2016. Catch our great tunes at the open stage in at the north side of Oak Point Park, 2801 E. Spring Creek Parkway, Plano, TX 75074. We’ll be there alongside all of the food booths and other activities going on at the Festival. See you there! The Men of Note provided music during the service for two churches this summer - Custer Road United Methodist Church on August 21 and Canyon Creek Presbyterian Church on July 24. 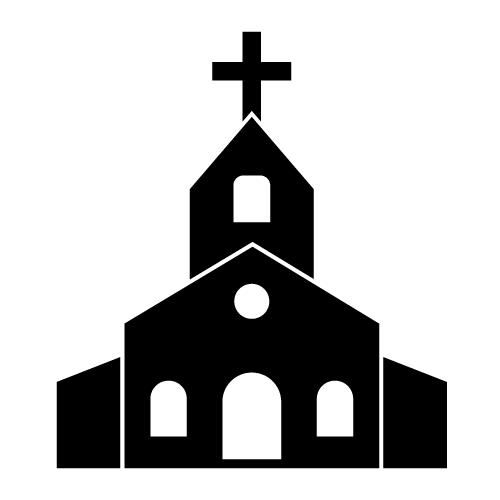 For these services, the Men of Note substituted for choirs on break for the summer. 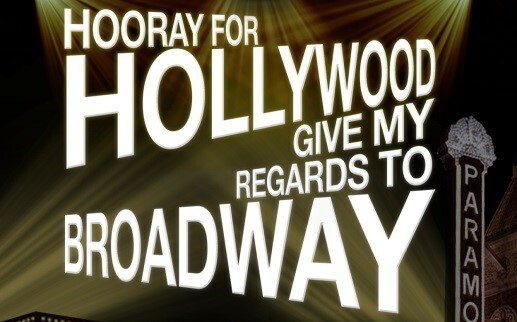 The Men of Note produced three shows in April with the theme of Hurray for Hollywood, Give My Regards to Broadway. The shows included hits from musicals and movies including Singing in the Rain, The Wizard of Oz, Les Miserables, An American Tail, Chitty Chitty Bang Bang and many others. As part of our outreach program to music educators, we have complimentary, no obligation tickets for you and a guest as well as a reception with refreshments before the show, during intermission, and after the show to meet you and share information.